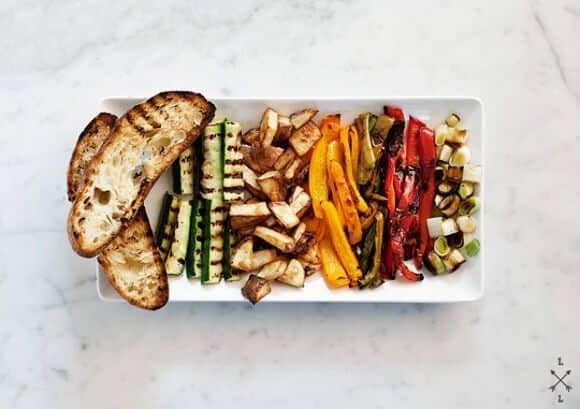 Sweet, smoky, and tangy romesco sauce served with grilled veggies and ciabatta makes an easy, healthy weeknight summer dinner or appetizer. Vegan. Thank you to everyone who left well wishes last week about my poor thumb and helpful suggestions for my fighting-dog issue. I’m doing much better now. Since I was one hand down last week my wonderful husband took over and cooked this lovely meal for us. Sunday night, I sat back and drank wine while Jack carefully peeled, chopped, prepped, and grilled. I surely did not make fun of him for how long it could possibly take one to trim a pepper, and I tried hard to keep my “helpful suggestions” to a minimum. And now about the food — romesco might just be my favorite sauce. Sweet, smoky, tangy… Serve it alongside veggies, fish, or meats, and don’t skimp on the grilled bread. Pop open a bottle of Cava, and pretend you’re on a patio somewhere in Barcelona. Romesco sauce adapted from Vegetarian Cooking for Everyone, by Deborah Madison. 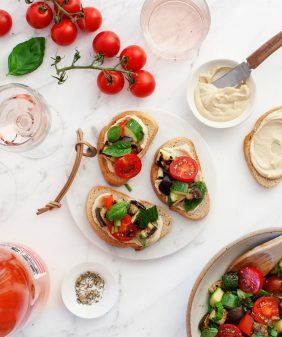 Make the romesco sauce: Place the roasted pepper, ciabatta, hazelnuts, almonds, garlic, tomato paste & water (or tomatoes), paprika, and vinegar in a food processor with pinches of red pepper flakes, salt, and black pepper. Pulse until well combined. Drizzle in the olive oil and process to form a thick paste. Taste and adjust seasonings. 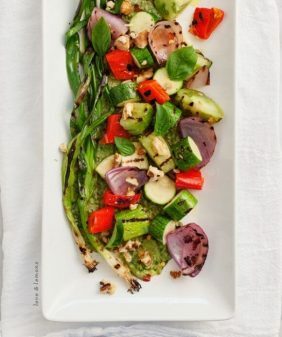 Grill the veggies: Toss your favorite veggies with olive oil, salt, and pepper and grill! We had leeks, peppers, zucchini, and also grilled slices of ciabatta bread. We also roasted some potatoes in the oven (because I thought they would take too long to grill). 450 degrees for 20-25 minutes or until crispy and brown on the edges. Serve with the romesco sauce and some good wine. *To blanch the nuts, drop in boiling water for about 30 seconds, remove and transfer to a bowl of water filled with ice. Skins should slide right off. This is absolutely stunning, Jeanine. Love the sauce! This is such a fabulous dinner! Yum! 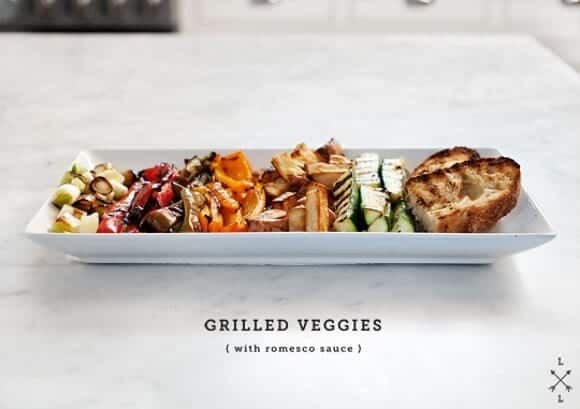 Love romesco and love grilled veg. Perfect Sunday night meal. 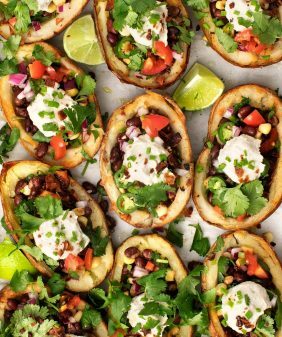 We love potatoes on the grill too, but they are high-maintenance & take up a lot of space. It’s high time I tried romesco sauce, huh? Red bell peppers are my favorite. I agree, romesco sauce is delicious with roasted veggies! 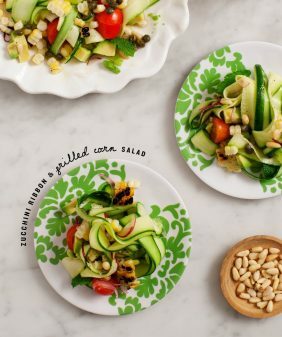 This looks like the perfect summer dinner. Yum! Gorgeous presentation! I recently stumbled upon your blog and wanted to tell you how much I like it, I love the layout and your pictures (which camera do you use?) but I particularly love the recipes, everything sounds mouthwatering! Thanks Sophia! We use a Canon 5D. 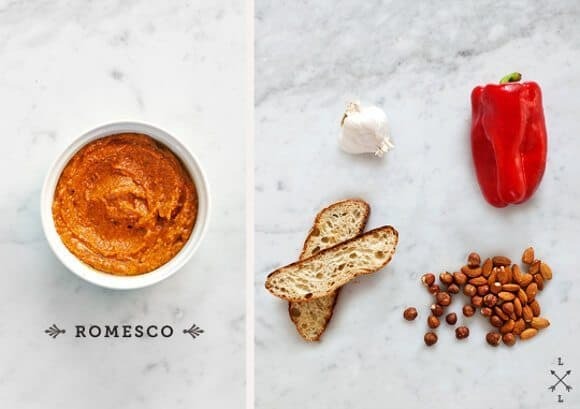 Romesco is one on my favorite sauces too – I haven’t made it for a while, great idea to serve it alongside all the summer vegetables in our near future! 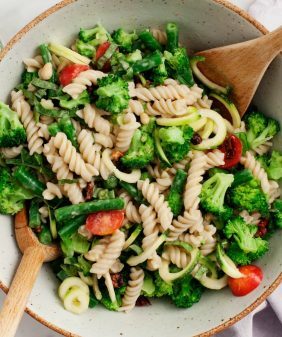 What an amazing looking dinner – the romesco sauce looks to easy not to make, I am going to have to give this a try! yummmm, im such a fan. Two times recently I’ve eaten this. I too was going to prepare a romesco for the blog. I had the best one at Prune where they baked the veggies en papillote and served it along side it. Also having grilled leeks from Tia Pol a great tapas place. I’m firmly of the opinion that romesco makes (almost) anything better! love this! 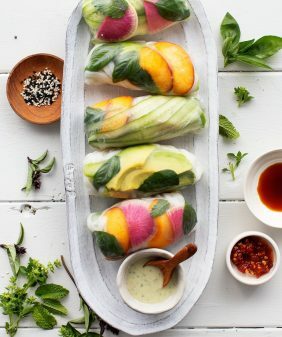 looks so perfect and great for a party with that sharp presentation. About Lena´s comment: are leeks exactly the same as the “calcots” we have in Spain? I love this recipe and have made it pretty consistently over the past several years. I often sub whatever nuts/seeds I have around for the almonds and hazelnuts. Tonight I did a combo of sunflower seeds and almonds which turned out really well. Anyway, I figured out a couple of years ago that I can cheat and use jarred roasted red peppers without any ill effect on the delicious flavor. Just wanted to share that little shortcut in case it helps anyone! I absolutely love this romesco sauce!! !